It’s going to be a fantastic weekend, San Diego! We’ve got tons of area events including Pumpkin Palooza on Saturday, Trick or Trot Fun Run on Sunday, Greek Festival in Temescula, Halloween Carnival & Haunted House in Carlsbad, Rise of the Jack O’Lanterns all weekend, Kids Free in October at participating Museums, & much more! As always, we also have a big list of San Diego events and over $750 in giveaways to fill up your weekend. This entry was posted in Active Lifestyle, All Ages, Art, Carlsbad, Chula Vista, Del Mar, Downtown, Escondido, Events, Family Friendly, Festivals, Film, Food & Drink, Free, La Jolla, La Mesa, LGBTQ, Music, Rancho Santa Fe, San Marcos, Solana Beach, Sports, Trivia, Vista and tagged 2015 san diego all ages events, 2015 San Diego beer festivals, 2015 san diego events, 2015 san diego family friendly events, 2015 san diego festivals, 2015 san diego food festivals, 2015 san diego free tickets, 2015 san diego halloween, 2015 san diego halloween events, 2015 san diego halloween parties, 2015 san diego haunted houses, 2015 san diego october events, 2015 san diego pumpkin palooza, 2015 temecula greek festival, carlsbad california events, del mar california events, downtown san diego events, escondido california events, family friendly san diego events, free san diego all ages events, free san diego events, free san diego family friendly events, la jolla october events, Rancho Santa Fe Events, san diego all ages events, san diego art walks, san diego beer events, san diego brunch, san diego concert events, san diego concerts, san diego fall festival, san diego family friendly halloween events, san diego fashion week tickets, san diego festivals, san diego food & drink events, san diego food festivals, san diego fun runs, san diego halloween events, san diego halloween parties, san diego haunted houses, san diego october events, san diego pumpkin palooza, san diego sunday brunch, san diego ticket giveaways, san diego trick or trot, san diego win tickets, San Marcos Events, Solana Beach Events, temecula greek festival. We are giving away a pair of tickets to the Singles Masquerade Ball at Bang Bang on October 28th! To win, comment on this post why you’d like to attend. Winners will be drawn and emailed Monday, October 26th. Early Bird Tickets ($20/piece) — Note: If you buy tickets & then win this giveaway, your paid money will be refunded! Come one, come all, to the singles masquerade ball! Halloween is around the corner, and San Diego Life Events is matching San Diego singles again! Meet someone special in an organized, low-pressure environment with other eligible bachelors and bachelorettes. This entry was posted in Events, Music and tagged 2015 san diego halloween, 2015 san diego halloween events, 2015 san diego halloween parties, 2015 san diego october events, 2015 singles masquerade ball san diego, 2015 singles parties san diego, san diego cocktail events, san diego costume events, san diego events, san diego food and drink events, san diego free tickets, san diego halloween, san diego halloween events, san diego halloween parties, san diego massaquerade ball, san diego music events, san diego october events, san diego win tickets, singles masquerade ball san diego, singles parties san diego, win tickets san diego, win tickets singles masquerade ball, win tickets singles masquerade ball san diego. It’s going to be an amazing autumn weekend, San Diego! We’ve got tons of area event listings including Little Italy FESTA on Sunday, Ocean Beach Oktoberfest & Oktoberfest in El Cajon, Old Town’s Fall Festival & Beer by the Bay on Saturday, get ready for Halloween at the San Diego Costume Guild’s Annual Sale, La Jolla’s Art & Wine Festival, & much more! As always, we also have a big list of San Diego events and over $700 in giveaways to fill up your weekend. This entry was posted in Active Lifestyle, All Ages, Art, Carlsbad, Chula Vista, Coronado, Del Mar, Downtown, El Cajon, Escondido, Events, Family Friendly, Festivals, Film, Food & Drink, Free, Imperial Beach, La Jolla, La Mesa, LGBTQ, Mission Beach, Music, Ocean Beach, Oceanside, Old Town, Rancho Santa Fe, San Marcos, Shopping, Solana Beach, Trivia, Vista and tagged 2015 el cajon oktoberfest, 2015 la jolla art and wine festival, 2015 la jolla october events, 2015 ocean beach oktoberfest, 2015 san diego all ages events, 2015 San Diego beer festivals, 2015 san diego events, 2015 san diego family friendly events, 2015 san diego festivals, 2015 san diego food festivals, 2015 san diego free tickets, 2015 san diego halloween, 2015 san diego halloween events, 2015 san diego halloween parties, 2015 san diego haunted houses, 2015 san diego little italy festa, 2015 san diego october events, beer by the bay 2015, beer by the bay coronado, downtown san diego events, el cajon oktoberfest, family friendly san diego events, free san diego all ages events, free san diego events, free san diego family friendly events, good food community fair san diego, la jolla art and wine festival, la jolla events, la jolla october events, little italy festa, ocean beach oktoberfest, oktoberfest in el cajon, Rancho Santa Fe Events, san diego all ages events, san diego art walks, san diego beer events, san diego concert events, san diego concerts, san diego fall festival, san diego family friendly halloween events, san diego fashion week tickets, san diego festivals, san diego food & drink events, san diego food festivals, san diego halloween events, san diego halloween parties, san diego haunted houses, san diego little italy festa, san diego little italy festivals, san diego october events, san diego old town's fall festival, san diego september events, san diego ticket giveaways, san diego win tickets, San Marcos Events, Solana Beach Events. Win Tickets ($150): San Diego Zombie Crawl through Gaslamp Quarter | Halloween Night, Exclusive Parties with DJs, Performers, Drinks, & More! We are giving away a pair of tickets to San Diego Zombie Crawl through the Gaslamp Quarter on Saturday, October 31 – Halloween night! To win, comment on this post why you’d like to attend. Winners will be drawn and emailed Wednesday, October 28th. Thousands of ghouls and goblins are set to take over Downtown San Diego’s famous tourist attraction, the Gaslamp Quarter on Saturday, October 31! Visitors can roam the ghoulish Gaslamp with the masses, or heighten their Halloween experience through SDZC – San Diego Zombie Crawl, the golden ticket to the city’s top Halloween events at the top 25+ nightclubs and bars along the freakish Fifth Avenue (with “adult treats” included). 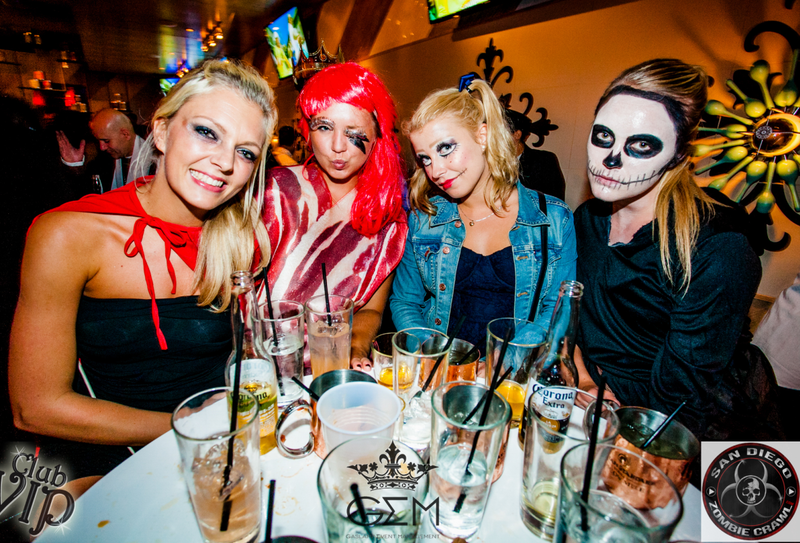 This entry was posted in Events, Food & Drink, Music and tagged 2015 san diego halloween, 2015 san diego halloween events, 2015 san diego halloween parties, 2015 san diego october events, 2015 san diego zombie crawl, 2015 san digo pub crawls, san diego block parties, san diego events, san diego food and drink events, san diego free tickets, san diego halloween, san diego halloween events, san diego halloween parties, san diego music events, san diego musicals, san diego october events, san diego parties, san diego pub crawls, san diego win tickets, san diego zombie crawl, win tickets san diego.